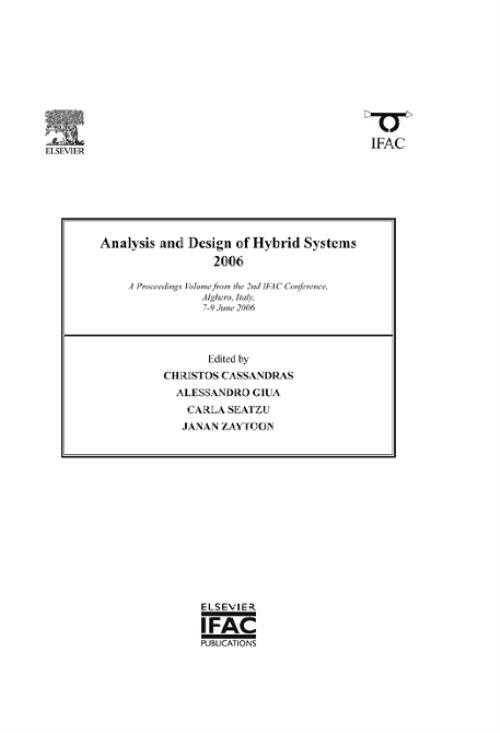 This volume contains the proceedings of Analysis and Design of Hybrid Systems 2006: the 2nd IFAC Conference on Analysis and Design of Hybrid Systems, organized in Alghero (Italy) on June 7-9, 2006. ADHS is a series of triennial meetings that aims to bring together researchers and practitioners with a background in control and computer science to provide a survey of the advances in the field of hybrid systems, and of their ability to take up the challenge of analysis, design and verification of efficient and reliable control systems. ADHS'06 is the second Conference of this series after ADHS'03 in Saint Malo. Challenges and Opportunities for System Theory in Embedded Controller Design (A. Sangiovanni Vincentelli). Optimal Control in Hybrid Systems (C. Lung, P. Riedinger). Continuous and Hybrid Petri Nets. Modeling and Simulation of Hybrid Systems. Control of Hybrid Systems 1. Structural Analysis and Approximation of Hybrid Systems (Invited). Control of Hybrid Systems 2. Controller Design Based on Hybrid Models of Industrial Plants (Invited). Applications of Hybrid Control (Invited). Hybrid Simulation Tools: Principles, Challenges and Applications (Invited).